Herons Park Nursing Home, set in the quiet parkland of Spennels Wood, but still only 5 minutes from Kidderminster town centre, has been operated by the current providers since 1999. Herons Park became a nursing home in 1990 when a residential property was extended, adding a number of purpose built ensuite rooms. Acquired by Royal Bay Care Homes in 2005, the home later went through another large transformation and refurbishment when the original house was knocked down becoming our dedicated dementia unit, completed 2011. The dementia unit was designed and developed in consultation with the Dementia Services Development Centre (DSDC) based at the University of Stirling. The DSDC draw on research and practice, from across the world, to provide a comprehensive, up-to-date resource on all aspects of dementia. Later in 2012, our dementia unit was awarded Gold accreditation from the DSDC for adhering to a number of best practices for dementia care. With an oustanding reputation for care in the local community, Herons Park Nursing Home is run by the Registered Manager Janet Galloway, Head of Nursing Pam Mills, Head of Dementia Donna Hales and a team of dedicated staff with a number of relevant health care qualifications. The home is also in the process of submitting for their Gold Standards Framework accreditation (GSF). A framework for implementing improved coordination and better organisation to deliver better outcomes in line with their needs and preferences for people nearing end of life care. The Home is also a member of the Registered Nursing Home Association (RNHA), an organisation Formed in 1968, the RNHA campaigns strongly for high standards in nursing home care. Our members are nursing home owners committed to delivering quality services to their patients. 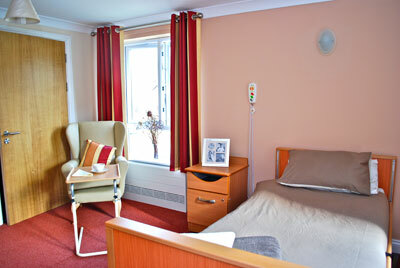 Herons Park Nursing Home is part of Royal Bay Care Homes Ltd. The Group is based in West Sussex and owns a number of Care Homes in Sussex, Dorset, Northamptonshire and Worcestershire. Royal Bay is an expanding group committed to the highest standards of care. It has been operating as a group for some 10 years, and its management team has experience in the care sector since 1976. To learn more about our Corporate Team, please click here. For general information about Royal Bay Group, including its overall provision of care services and other related activities, please click Royal Bay Care Homes.